Wake up with a smile in one of our spacious suites and enjoy a coffee on your own private balcony. A favourite Ottawa hotel located in the heart of downtown, Cartier Place Suite Hotel is popular with both families and business travelers – offering all the amenities you require including complimentary wireless Internet. Our clean and comfortable suites feature a full kitchen, combined dining/living area, a pullout Sofa bed with a double bed and separate bedrooms. Whether you visit for one night or for an extended stay, our accommodations will take care of your every need. A nice alternative to Airbnb. These suites are located in the quiet residential wing of our hotel. Suites feature a separate bedroom with comfy duvet. The full kitchen and spacious dining and living area with a sofa bed offers everything you need to enjoy your stay. Relax on your private balcony knowing you have all the comforts of a hotel. Ask us about our extended stay rates for this suite. 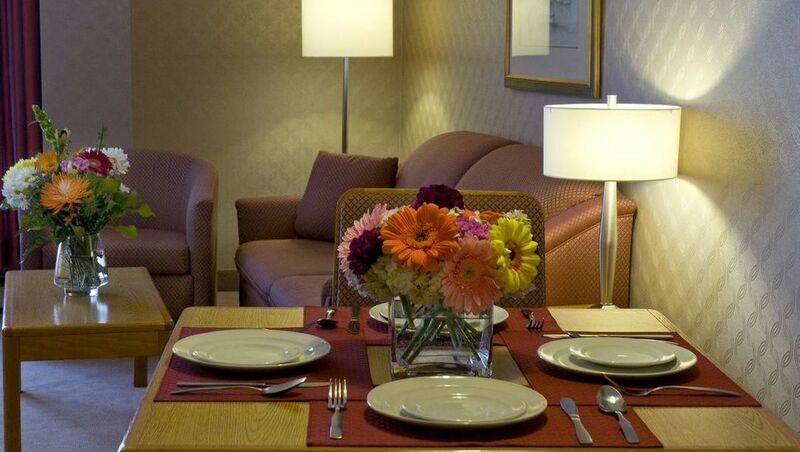 Located in the main hotel these suites are perfect for the business traveler and small families. Suites feature a separate bedroom with queen bed and comfy duvet. 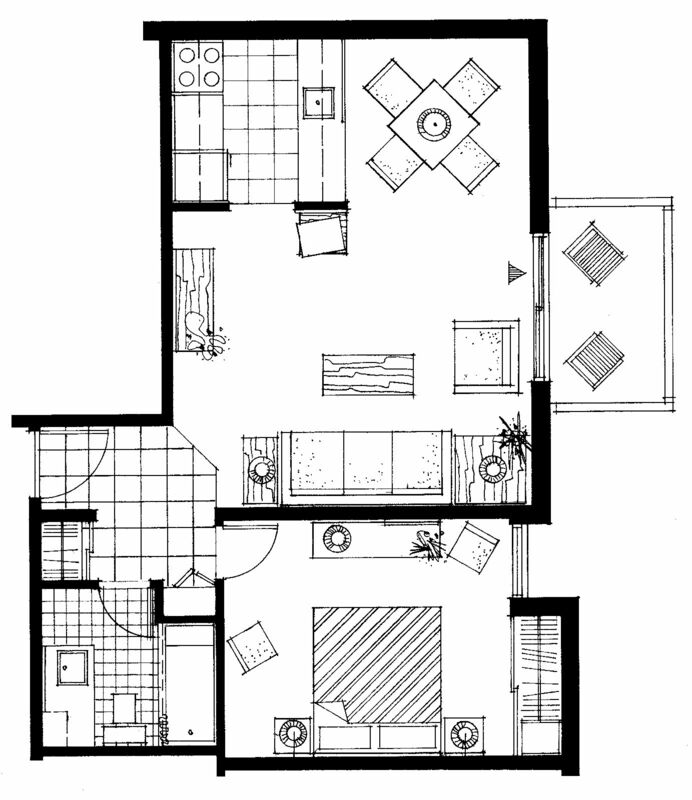 The full kitchen, dining and living area with a sofa bed offers a relaxing work and family area. Enjoy your private balcony and take in the city. A cozy suite located in main hotel with all the amenities of home. This suite features a separate bedroom with queen bed and comfy duvet. The galley style open kitchen, combined dining and living area with sofa bed create an intimate area for work or relaxing. Enjoy your private balcony overlooking the back garden area. These suites also offer an option to adjoin to a Deluxe Double One Bedroom Suite, subject to availability. This spacious suite is ideal for friends or groups visiting the Capital. Located in main hotel this suite features a separate bedroom with two extra-long double beds with duvets for your comfort. 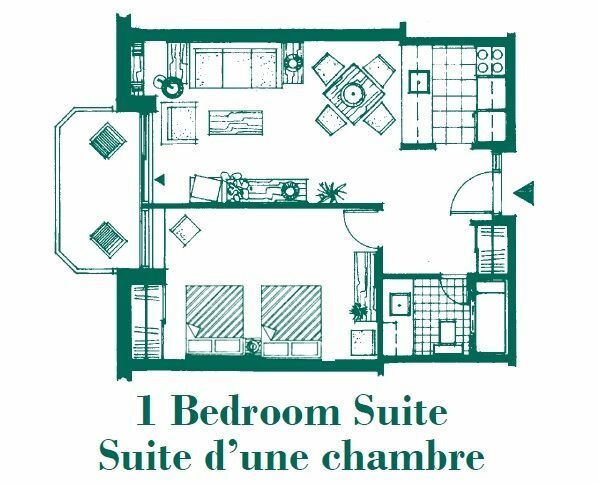 The full kitchen, dining and living area with sofa bed provides plenty of room for all to enjoy inside or relax outdoors on your private balcony. These suites also offer an option to adjoin to a Deluxe Queen One Bedroom Suite, subject to availability. Spoil yourself and indulge in our deluxe King one bedroom suite. This suite is located in the main hotel and features a separate bedroom, king bed with duvet and fluffy bathrobes. The full kitchen, spacious dining and living area with sofa bed is all yours to relax and enjoy. While on business for your convenience, this suite offers office amenities. Fun for the whole family or a group of friends. This suite is located in the main hotel and features a private balcony overlooking the back gardens. 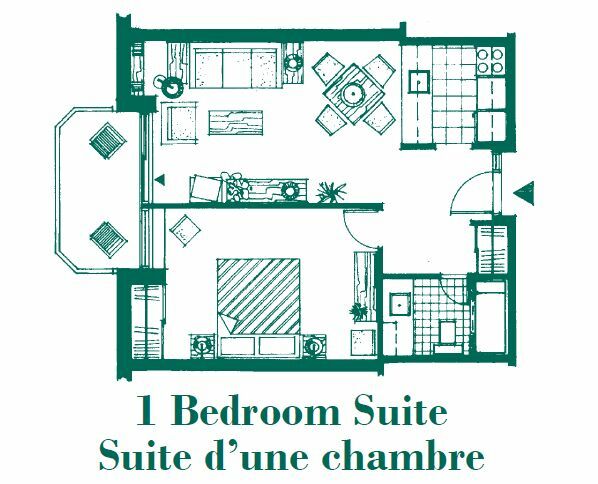 There are two bedrooms, one with a queen bed with duvet and the other with two twin beds. The full kitchen, spacious dining and living area with sofa bed offers an enjoyable time for all. Our VIP One Bedroom Suite offers chilled complimentary champagne and a separate bedroom with king bed with duvet and fluffy bathrobes. Enjoy a jacuzzi bath in the privacy of your own suite. Relax in your living room or plan a romantic evening on your private balcony. Our impressive two bedroom Penthouse Hospitality Suite features city views. Sip chilled complimentary champagne from the rooftop terrace as you relax or entertain guests. The master bedroom has a king bed with duvet. The master bathroom features a jet tub and separate standing shower. The second guest bedroom offers a queen bed with duvet. This suite features a guest powder room, spacious combined living area with large LCD television, DVD player, sound system, leather sofas, gas fireplace, dining table for eight and a desk work area. 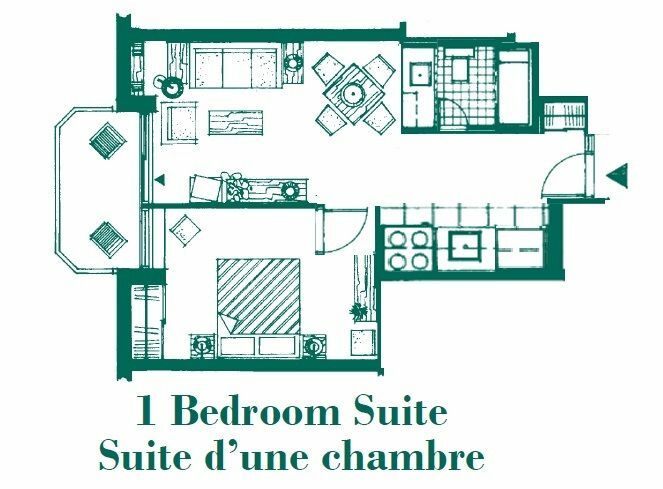 Added amenities include a large closet, walk-in storage, en suite laundry room, as well as a full size eat-in kitchen with table for four. This suite is ideal for that special night, entertaining or for hosting business meetings in a comfortable atmosphere. 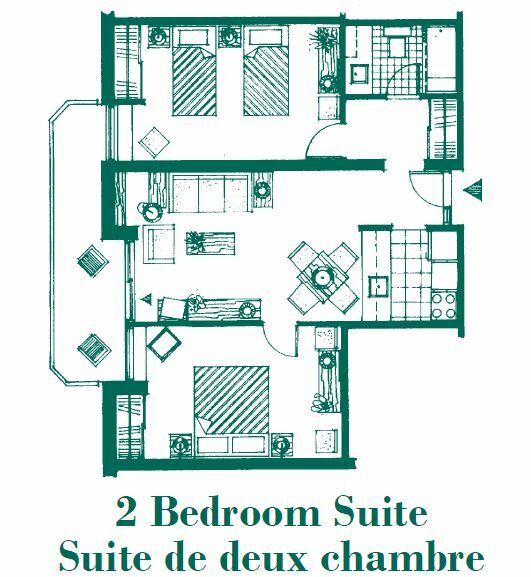 To reserve this special suite, please call 613-236-5000 or 1-800-236-8399. Experience a timeless elegance with our Executive King One Bedroom Suite, created with the sophisticated traveler in mind. Providing comfort and style, the Executive King Suite captures spacious accommodations with a combined living room and dining area and an open concept kitchen . Enjoy the modern glass shower with hydromassage jets for maximum relaxation. This suite also features a sectional sofa, bathrobes and a private balcony.